"OW! What did I do?!" The rolling pin as a weapon, often aimed at someone's head. Most often wielded by a cook, or else a woman (especially of the Apron Matron persuasion). An Improbable Weapon, though one that does have reasonable efficacy. Closely related to the Frying Pan of Doom and often used in conjunction with it. Note that most of these rolling pins are made of wood, as plastic is usually too light to do any damage. A Henpecked Husband is a usual target of this. In Marvel Adventures Spider-Man #56, Chat hits Dagger with a rolling pin. Chachi Bini, the wife of famous Indian comic character, Chacha Chaudhary, always has a rolling pin (belan) in her hand. She often uses it as a weapon against thieves and robbers. In Marvel Comics Presents ALF Issue #8, it is subverted in his own What If? : ALF, after being chased by Raquel Ochmonek for his mischief, ALF lampshades that he's lucky that The Comics Code Authority had her throwing a feather-duster, not a rolling pin, which Trevor Ochmonek agreed wholeheartedly... since it hit him instead! Monica's Gang had a Romeo and Juliet parody featuring Jimmy Five as Romeo and Monica as Juliet. Friar Smudge told Romeo Jimmy the marriage would be so Monicapulet would stop hitting them with that bunny. Jimmy was interested until Smudge showed a rolling pin and told Jimmy that's what wives hit their husbands with. Suske en Wiske: Tante Sidonia uses rolling pins often to defend herself. Nero: Madam Pheip and Madam Nero's favorite weapon of defense. In Asterix, chieftain Vitalstatistix's wife Impedimenta has an anachronistic rolling pin as weapon of choice to bash Romans with. She uses one in several Animated Adaptations as well, like The Twelve Tasks of Asterix and Asterix and the Big Fight (other women of the village do the same in the latter). A standby in the Andy Capp newspaper comic since 1957. In The Wrong Trousers, Gromit brandishes a rolling pin at Feathers McGraw. Feathers responds by pulling a gun on Gromit and forcing him into the wardrobe with Wallace. In Oliver & Company when housekeeper Winston hears noises coming from Georgette's room he gets ready to attack the intruder with the rolling pin he was already holding. In Sherlock Gnomes, Moriarty's primary weapon is a rolling pin. (He was originally the mascot of a pie company.) During the climax, he fences Sherlock with him using his rolling pin and Sherlock using his magnifying glass. Shows up in Dolores Claiborne. Billy kills his mother with one in the Black Christmas (2006) remake. In Hancock, the eponymous character breaks one over Charlize Theron's head, but she's just as invulnerable as he is. This is the Weapon Of Choice for the wife of Pekka Puupää (Puupää meaning Woodhead, as in someone dense) Justiina in the Finnish series of comedy films called Pekka ja Pätkä (Pekka and Shorty/Stumpy). She is an Apron Matron, with a will strong enough to bend steel (not literally), and she has quite the Death Glare to boot. Midnight Movie: In the Film Within a Film ''The Dark Beneath", the killer's mother uses a rolling pin to knock out one of the girls for her son. "Masha, can I borrow your rolling pin for a couple hours?" "Sorry, neighbor, I'm still waiting for my own drunkard." "Hello? My husband gave me for a present a kitchen kit he bought from you, but the rolling pin is missing!" "He refused to take it." "My little worker bee... at this hour, and you are still baking." In Howl's Moving Castle (the book) there was a brief mention of "angry aunts with rolling pins" coming after Howl. In the Gordon Korman series Island, one brother and sister hospitalized one another on Halloween night. She was a chef armed with a marble rolling pin. We're not told what he was carrying. The Ogden Nash poem "The Comic Spirit or Never Say Die, Say Kick The Bucket" describes a cartoonist whose life was a stream of classic comic strip tropes. When his wife finally had enough of it all, she naturally used a rolling pin to do him in. On Mama's Family, when Mama thought her family was planning to send her to a home (it was actually a dog they were talking about), her rolling pin was her weapon of choice for defending herself. Vince Gill's "One More Last Chance" describes a woman coming after her husband with a rolling pin and a Bible: "If you don't listen to my preachin', boy / I'm gonna have to beat you half to death." Boris Vian's song "On est pas là pour se faire engueuler" ("We aren't here to get yelled at") is narrated from the husband's point of view, who comes home late and drunk with his best friend (in the same state) and experiences an Oh, Crap! moment when he sees his wife holding the rolling pin and waiting for them in front of the door. It gets them both killed. From Oliver! : "Only it's wise to be handy with a rolling pin when the landlord comes to call!" In the Met Opera's production of Donizetti's Don Pasquale, Norina playfully fences with Doctor Malatesta while they're making their plan, she with a rolling pin, he with a Classy Cane. The Drowsy Chaperone has two buffoonish gangster characters who disguise themselves as pastry chefs, making this trope perfect for them. Disneyland's Pirates of the Caribbean ride has at one point a large woman chasing a food-thieving pirate with a rolling pin. In the first level of the arcade game Dragon's Lair II: The Time Warp, Dirk is pursued, after the kidnapping of Daphne, by his irate mother-in-law, who is wielding a rolling pin. This item in World of Warcraft. Filomena of Urban Rivals wields a rolling pin. Several rolling pins can be found in the Wastelands, likely as a gag weapon. They are also in Fallout: New Vegas... even going as far as including a street gang consisting of old ladies equipped with rolling pins that ambush you in an alley. You can have one in Runescape as a weapon. A few enchanted rolling pins can be found in Neverwinter Nights 2. In Paper Boy, a woman chases you with one of these. In MediEvil, there are brainwashed women in the sleeping village that chase Daniel around with these. Unfortunately, he can't fight back, as they are essentially innocent people and killing them will cost him pieces of the Chalice. In The Bourne Conspiracy (the video game based on The Bourne Identity), one of the enemies on Wombosi's ship kitchen will use a rolling pin to fight you in hand-to-hand combat. You can wield one in Ultima VI. It's half as effective as a common knife. In the "French Baker" minigame from Action52, the eponymous baker throws rolling pins (If you can get the game to work). All the multiplayer characters of BioShock 2 can use a rolling pin as their melee weapon. The rolling pin is one of many household items that can be drafted for combat duty in Project Zomboid. It's only mediocre — much better used for making actual baked goods — but if you're desperately scrabbling through kitchen cabinets and your only other choice is a butter knife, take the pin. In the browser game Bash Girl , each enemy has two variants; one enemy has a variant that wields a Rolling Pin of Doom, and a variant that wields a Frying Pan of Doom. Perhaps most famous in The Flintstones — Wilma does occasionally throw one. Courage the Cowardly Dog. 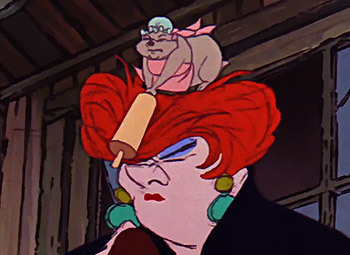 Muriel almost always whacks Eustace in the head with her rolling pin after he has finished scaring Courage. Eustace: OW! What did I do?! In Tom and Jerry, Tom's owner would often come running out of the kitchen attempting to swipe Tom with a rolling pin after Tom had destroyed the house attempting to catch a single mouse. Failing that it was a broom. The short "Wild Wife" is about a housewife recounting her hectic day to her husband, who thinks she has it easy. It ends with her giving him a gift: a rolling pin monogramed "His". Three guesses what she does next. Marsha: Little man, I've had a busy day. In another Looney Tunes cartoon, Miss Prissy goes after Foghorn Leghorn with a rolling pin, wanting to make him her husband. Foggy replies, "You're going about it all wrong. You don't bat 'em on the bean with a rolling pin. (aside) That comes later." In the "Apes of Wrath", Mama hits Elvis over the head with a rolling pin for scaring the "baby" (actually Bugs Bunny in a case of Mistaken Identity caused by a drunken Delivery Stork). Subverted in US of Archie (American History taught by Archie Comics characters), where at a meeting of early 20th-century suffragettes, one lady says she convinced her husband to support women's right to vote — as she brandishes her rolling pin. The others glare at her, as they said earlier that they did not intend to resort to violence. She then explains that tasting her homemade apple pie convinced him to change his mind.